Location: Northern DesPlaines River Illinois. 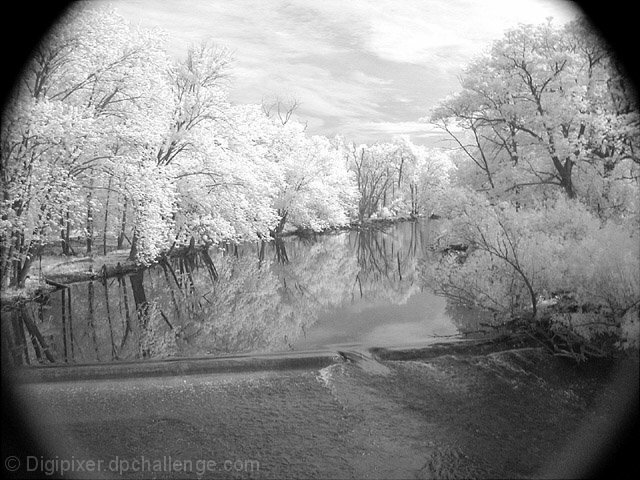 Infrared pix of a DesPlaines River dam in northern Illinois. I love this photo. My favorite. It seems so unreal. Good job! Sorry I didn't comment. Didn't have a lot of time. I would like to thank everyone for voting so high on my first post. I used a Tiffen # 87 infrared filter. The filter was too small for my camera--so I had to use a series 6 adapter.That combination left the vignetting. Cropping eliminated too much of the pix. The angle of view came form my position on a jogging path bridge about 60ft. above the river.The sun was infront of me (about 11:00) and that litup the lower edge of the filter and holder,this gave it a rounded-globe look. Thanks again,Bill. I would have prefered this image without the vignette. Top shot, very interesting. You either had great light or great skills with your photo program or both. Good job. infrared? Interesting image anyway. I like it. Beautiful scene - and I love the "globe" effect caused by the vignetting. Nice IR, and works well with the fisheye to make an 'otherworldly' effect. I'd rotate it CW a little to straighten the horizon and crop out the vignetting. Interesting. No complaints here. This is one of my favorite photos. The exposure on the trees is very effective. Nice. I like the way you used the vingetting to your advantage. Not usually a fan of this type of photograph, but this one is well done. Did you use a green filter? I love the white on the trees and the stillness of the water changing to the texture of movement. The only thing I might have done differently is to straighten the whole thing within the frame. Absolutely stunning. The composition is just wonderful with the trees framing either side... it leads the viewers eye right up the water. While there's nothing much you can do about it, it would be nice if there were just a tad bit more definition between the light trees and the sky. This is my favorite of all the submissions. It's got me beat. But I like it. My monitor loses some highlight detail..otherwise looks great. Very nice, I wish there is a little bit more contrast between the trees and the sky. This almost looks like a fairy tale land. Beautiful reflections and the trees are gorgeous. beautiful picture without the distracting edges. why are they there? The leaves in the center strike me as a little too white, almost overexposed. Still, very good. Outstanding tone, dof and composition. Nice job!! This is a really good picture. It conveys so much mood and is one of my favorite photos this week. I get the Crystal Ball aspect, but it almost takes away from the image by having the corners cropped out. Still, it is powerful. Wow, where do you find a place like this? It looks absolutely beautiful. Oh my god this is a perfect shot! Why did u do that crystal thing to it?! Beautiful show, but I do not like the vignetting. WOW!!!!!!!!!! What a gorgious image....I wish I was right there, forever. Beautiful picture. The vignetting takes away from the image rather than add to it. Proudly hosted by Sargasso Networks. Current Server Time: 04/25/2019 10:28:03 AM EDT.